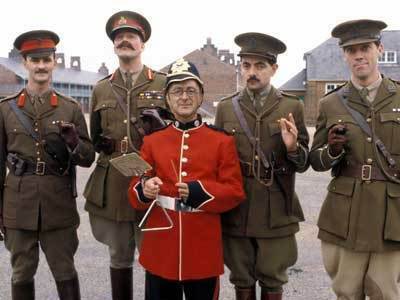 Hello and welcome to this months edition of Waffle On in which Captain Simon Meddings, Private Mark C Kelly and General Peter Coleman sneak out of the trenches and poke their heads out into no mans land (the Internet) and have a good old tally yarn about this classic British Comedy. It is of course 100 years ago that World War One started and it seems only fitting we offer this as our nod of respect to those who have fallen. Promos played this month are of Hypnobobs and Rusted Robot so please listen to them for their location details. Also as usual we throw in a little cheeky clip at the end of the show. To listen direct just press the little play button on the podbean site , or download via iTunes or Stitcher Radio. Waffle On is available on all portable devices so please just use your standard podcast catcher. We have a ever growing Facebook page so head over there and join in the fun.